The future of crane wire inspection is here - and it’s called LiveWire. Developed in partnership with mooring specialist Delmar Systems and patented by MDL, this brand new proposition tackles all the issues with current wire inspection and maintenance techniques that make this necessary operation unnecessarily costly. Mobilised on the quayside or on board a small-deck platform support vessel (PSV), LiveWire performs the inspection quickly and on-location at the wire owner’s convenience, and it accurately evaluates a rope’s condition throughout its entire length, without the need to relocate to deeper waters. LiveWire includes real-time Non-Destructive Examination (NDE), giving the service personnel instant identification of issues which can immediately be addressed with the crane owner. The system’s compact design and versatility allows a spare wire rope to be carried on board the PSV in case the wire is found damaged and a change-out is required. In summary, this specialised equipment ensures safe wire handling, providing asset longevity and life extension through minimising unnecessary cut backs or disposal. Learn more about the complete LiveWire inspection and maintenance service at Delmar Systems. From our design and manufacturing bases, Maritime Developments delivers market-leading product handling equipment for global energy projects. 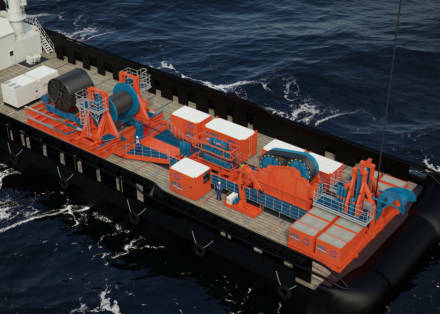 As well as wire inspection systems, Maritime Developments delivers the full turnkey package of back-deck handling equipment including pipelay tensioners, reel drive systems, overboarding chutes, spoolers, level winders, compensators and control systems. Our range of back deck equipment is designed and manufactured to comply with PUWER / LOLER requirements and can be CE marked. The LiveWire control system is designed for safe product handling with data logging as a standard feature. This ensures instant access to critical product lay information with the option to record the data which can be accessed during or post operation.